Brought a couple buddies down to the lake for the weekend (Tan-Tar-A Area). Neither of these guys fish much so my goal was to just get them bit. We targeted Crappie, Bass, and Whites just throwing easy chuck and wind baits.... And we were successful catching all three. 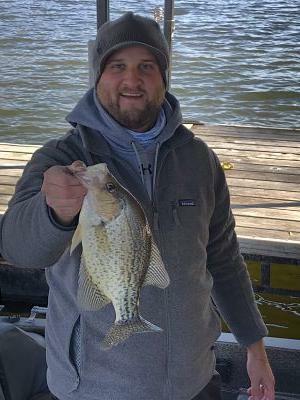 Crappie were caught shooting swim platforms on secondary points. Caught my biggest of the year.... A thick 13.5" Black! Bass were spread out. Best one came off the front corner of an isolated dock over deep water. Whites came on rocky mainlake banks with whatever wind we could find on them. Everyone caught a few fish so I was happy! Crappie - BG Baby Shad on a 1/16 oz Jakked Baits Blankenship Shooter Head.... That head is the DEAL for shooting docks!